SALES LIST -- RECENTLY ACQUIRED ILLEGALS: CHICAGO, MONTANA, ARKANSAS, ETC. The Frolics, Chicago, Illinois. A great find here. Only I have these chips, other than some collectors who bought a chip from me (I bought out all of the chips from a man in Wisconsin whose mother worked in the Frolics and rescued these chips). There are only 6 left of the brown chips and about 20 each of the red and orange chips. The chip might have a small edge nick. Click here to read all about the chips -- the order cards, history, scan of actual newspaper artice of Aiuppa's arrest at the Frolics, etc. 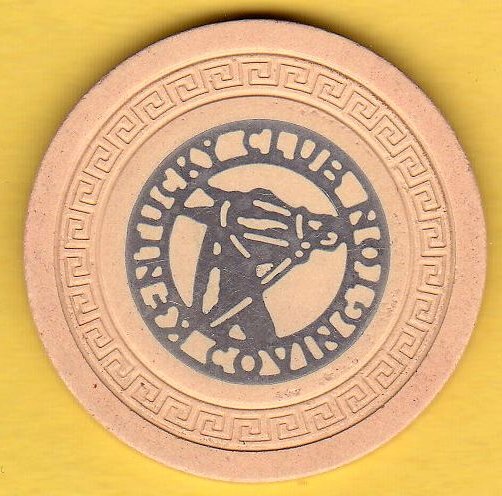 The title to the auction says a lot about the chips: "illegal Frolics Club: Chicago Mafia gambling poker chip; rare new find, casino,1950s, Joseph "Joey Doves" Aiuppa." Aiuppa eventually rose to the top of the Chicago mob ("Outfit"). 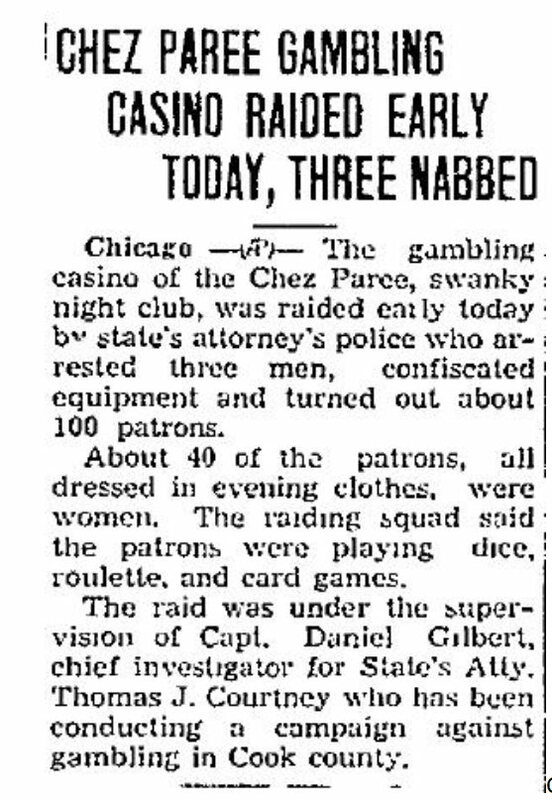 As I show in the auction description, he not only owned the club, but was arrested there (per Chicago Tribune newspaper story). The chips sold here are T-mold, very nice condition, though canceled with neat drill hole. 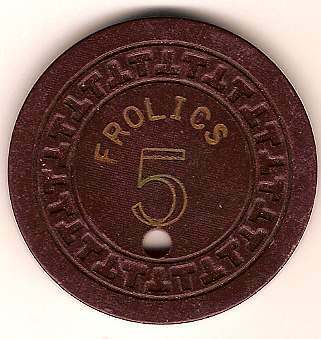 The bown 5s have the same "Frolics 5" on both sides. The orange Frolics 10 and red Frolics 30 have different small numbers on the back, which we believe are security numbers (each chip has a different number). The chip you receive might have a small edge nick. SOLD OUT -- only have 2 of the $1.00 chips in poor condition. Will sell for $7 each. 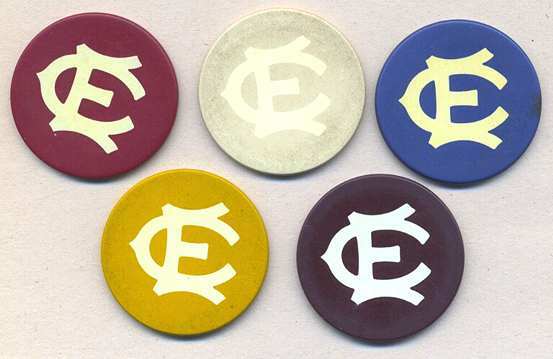 3 1896-1907 Chicago Merchants Club (CMC) poker chips/tokens. Same on both sides. (Note: the above is an old picture. I am down to my last set of four. 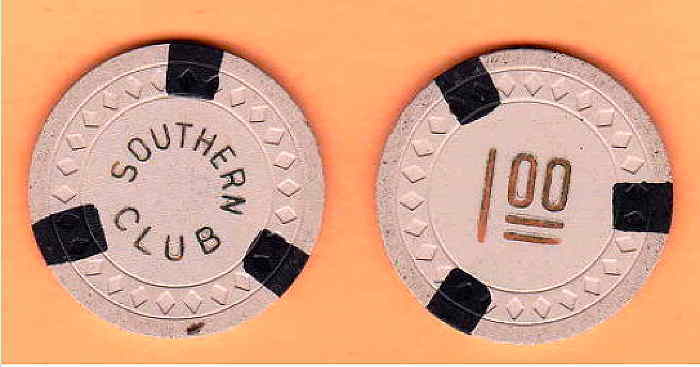 The three smaller chips are fine, but the $1.00 chip is brown for a section (about 1/6th of the chip) near the rim -- the brass coating is shot. I also have two other $1 chips that are similarly shot -- $5 each for those.) The CMC was famous in shaping the layout of the city to make it both attractive and commercially successful. The $1.00 chip is 1-1/2." The others are smaller. 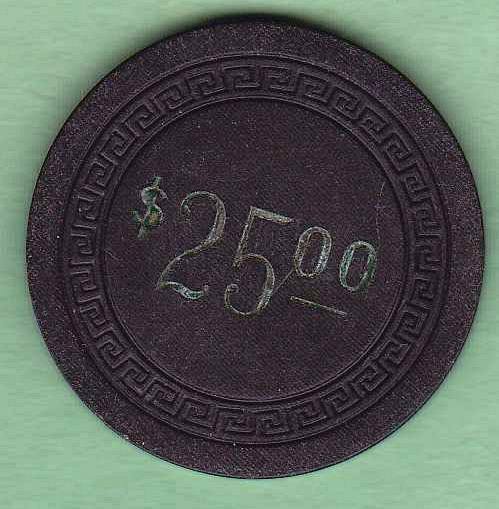 Tokens like these were commonly used 100 years ago throughout the country as poker chips and commercial (trade) tokens. Click here to read more about them and the famous CMC in my recent auction . I have only about 4 sets of these left. Only I have these Old Faithful, Livingston, Montana, chips, from the 1920's. Read the story about them from my latest completed auction: click here . The chips (1-1/2") are approaching 100 years old. 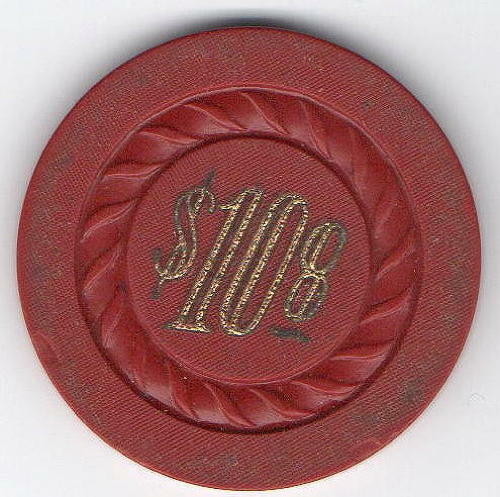 In many parts of the US, but particularly in Montana, "good-for" tokens like these were used for poker and other gambling games. If you look at Ed Hertel's illegal gambling guide, you will see the large number of token chips used in illegal clubs and bars in Montana. 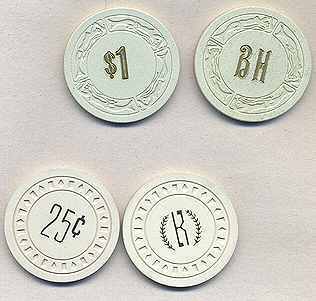 The small denominations exemplify the value of the dollar then, and the modest income of the residents. 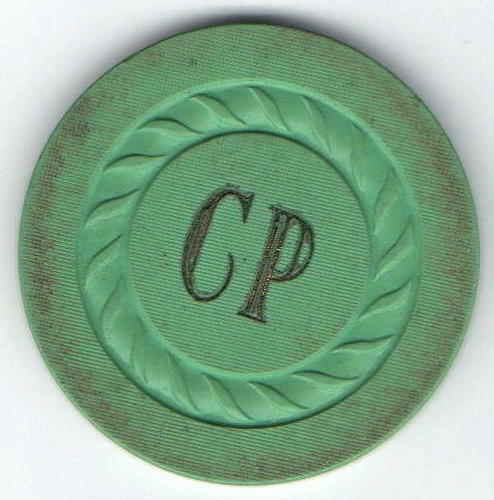 Tokens were also used in case of police raids -- the owners could claim that the chips were commercial tokens for change and advertising premiums. ... ... ..... The five chips say "Old Faithful, Livingston Mont." w/ the "club" symbol, one one side. 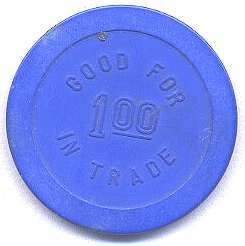 The reverse side says "GOOD FOR (so many cents) IN TRADE." 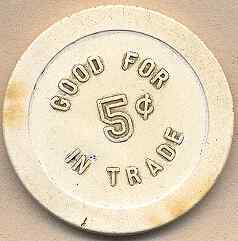 The five chips are: 5¢ Gray, 10¢ green, 25¢ brown, 25¢ red, and 50¢ light blue. Good/nice condition; the reds are a little soiled and might have an occasional small burn. This is my last $1 dark blue Old Faithful, Livingston MT, chips. The reverse side is like all the others ("Old Faithful Livingston Mont." w/ the "club" symbol). I am the only one with Old Faithful chips, and originally I had only five $1 blues. (The chip is DARK blue. I had to lighten the scan so the words could be better seen.) Only one of these is left! Just got these (Dec 2007). Have only 5 of them (12/17/07). Wheel Club, Billings MT. Maybe quite rare. Both sides of the chip are shown above. I have only a half dozen of the chips. Never saw before. Not in Hertel's illegal club chip guide. Not in The Gambling Table. 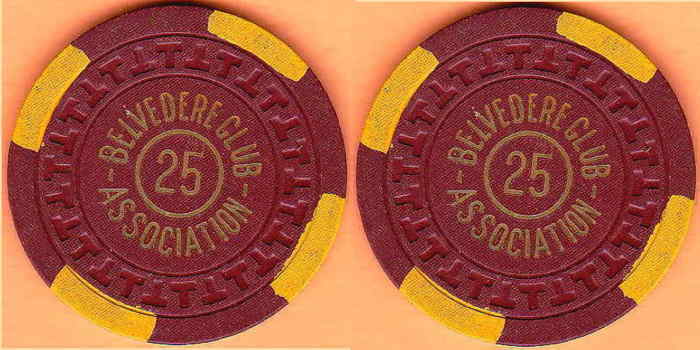 But just now, an author of The Gambling Table ID'd the chip for me as follows: "The Wheel Club opened in Billings in 1927 and is closed.." The chip is a casino chip size 1-9/16." It has no rim mold design. It is a thick square-edge chip. Sharp gold hot-stamp. This chocolate brown hub mold chip (some say the scan looks purple, but the chip is brown) has been ID'd by many authorities as from the Ship Fitters Union, 16th & Mission Street, San Francisco, CA. Hub Mold. Shipped to A. Gaughlin, Private Club (Opened: 1933 Closed:Yes). Cartamundi Playing Cards Co., Belgium, supplied the chips and playing cards for the 2006 movie and the chip auctioned here -- again, same chips in both cases. Take a look at my old auction for the story . There you will see the story behind the chips, and screen shots from the movie, starring Daniel Craig. 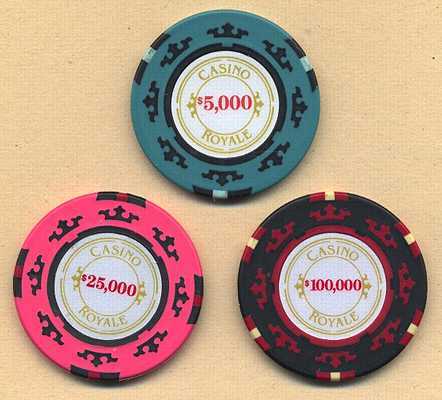 The screen shots show these chips, the only chips from the climactic poker tournament visible in the movie. These two clay chips came from the same gent who furnished me with all the other Montana chips on this page. He lives in Montana. The chips are unidentified as of now (ID would be appreciated). Call them UFC's. Probably from gambling clubs in Montana. You can have them for $2 per chip. ¶ white, blue -- $45.00 each. ¶ nice condition, much better than picture. This chip has just (Sept. 2008) been identified via the manufacturer order cards of the Portland Card Company. It was ordered by H.S. Hudson and shipped to Bee Hive Tavern, Coos Bay, Oregon, no date given on the card. 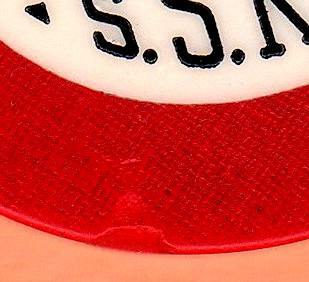 I applied toothpaste to the one of the chips, above, to highlight the square-in-circle embossed rim mold design. Fine condition. 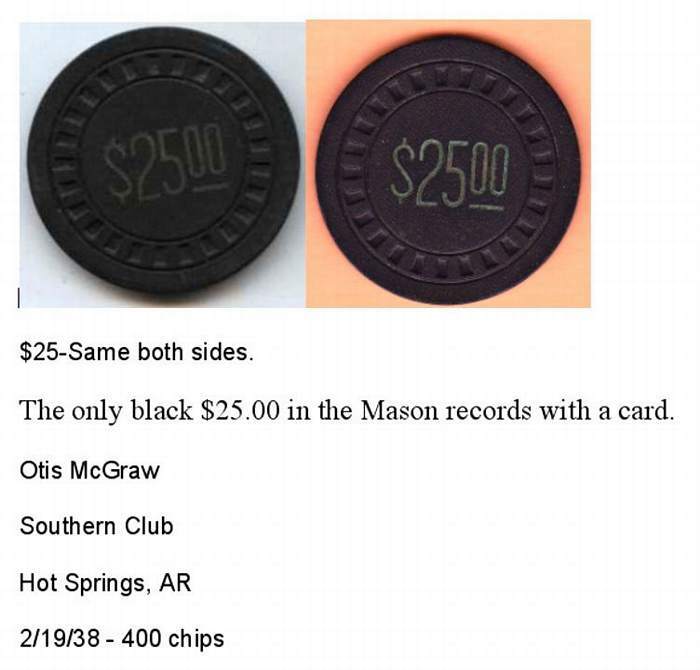 Pictures of chips (all from Hot Springs, Arkansas. 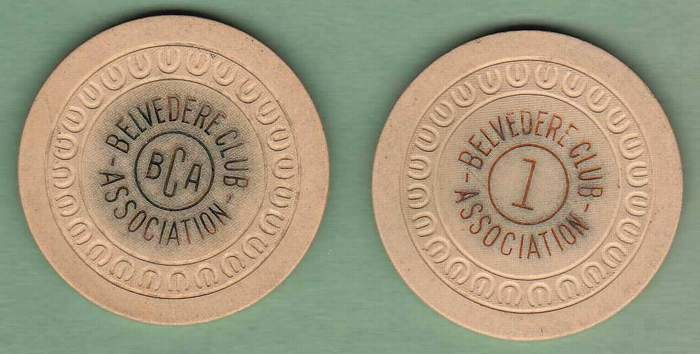 The Belvedere operated 1941 to 1964. The Southern, through many ownersips, was 1893 - 1964. The chips are used. I send the best condition I have, all OK in my opinion. Return privileges. PayPal OK. Other Arkansas illegals here.). $3 postage. Thus, he made the ID. New old discovery! 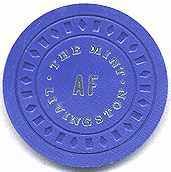 No collector knew of this chip in light blue till I found some in January 2014. They went for over $50 on eBay. 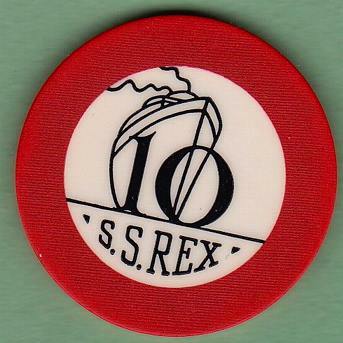 The SS Rex "opened: 5/1/1938, Closed: 1940 May 1938, Cornero bought and remodeled the SS Rex for $600,000, money believed to be fronted by Bugsy Siegel and actor George Raft. He operated three gambling ships, S.S. Tango, S.S. Rex, and S.S. Lux, off the coats of California between 1934 and 1946. The Rex’s capacity was 2,000 passengers; it had a crew of 325, including world-class chefs, a full orchestra, broadcasters manning a commercial radio station, and, of course, working girls. The casino offered craps, roulette, blackjack, chuck-a-luck, poker, faro, 150 slot machines, and a 400-seat bingo parlor. The horse book received its results via short-wave radio. The games were honest, and Cornero posted a $100,000 reward for anyone who could prove that they weren't. The Rex was so successful that Cornero and his partners netted upwards of $300,000 a month. Be sure to see these two great YouTube real videos of the gambling boat back then: here and here . crest and seal, serrated edge to chip. This is my last one. One side is very fine, no problems. The reverse side has the edge nick (seen here), but it can not be seen from the good side! 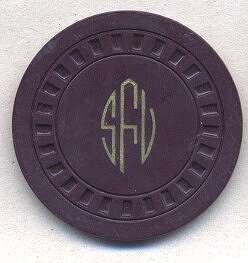 The chips have an unusual die-cut silver filigree inlay. Small key mold. The illegal club operated at 627 Scott St, Covington, Kentucky, from as early as 1943 until the mid 1950s. It was one of the largest clubs in Covington. "By the beginnings of World War II, gambling was wide open. During hot summer months the doors of the casinos stood open, concealing virtually nothing from the gaze of either the public or law enforcement. Here were no secret codes or names of friends to be dropped to gain admission. Anyone could enter a casino, customer tourist, or police officer." 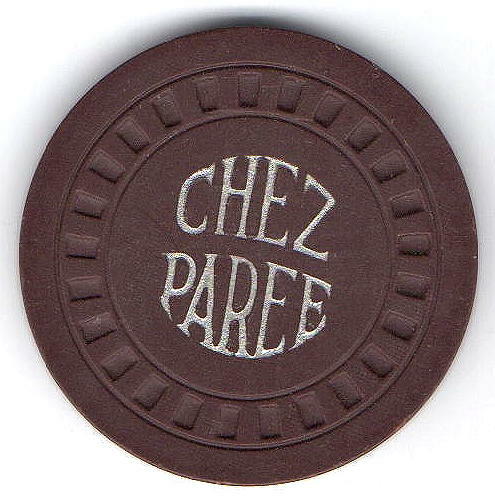 Chez Paree, Chicago, Illinois, 1932 - 1960. 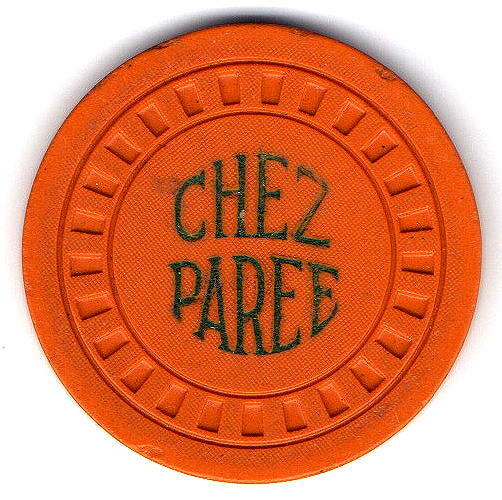 Chicago’s famous Chez Paree was arguably the most glamorous and famous dinner nightclub in the country in the 1930s, 40s and 50s. It opened in 1932 and closed in 1960. The authenticity of the chips is verified in the Chip Guide at http://themogh.org/cg_chip2.php?id=ILCH9 . 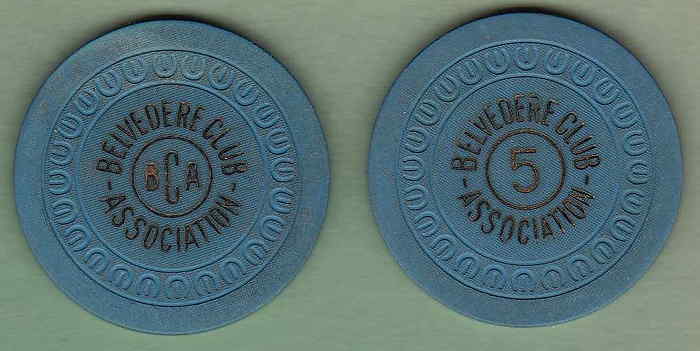 Furthermore, all 5 chips below came together from a sale to me by a woman familiar with the Club... .... Find a brief history of the club here: https://www.chezpareechicago.com/as-i-remember-it/ and http://www.parsec-santa.com/chezparee/ChezParee.html. ... .... A list of the entertainers who performed there (EVERY major act in the country!) is found here: https://www.chezpareechicago.com/acts/ . ... .... Gene Trimble has called the place “a major illegal operation in Chicago.” ... .... Newspaper story on gambling raid on the club: here. ... .... And look here (http://chez-chicago.com/) for information about The Chez, the event-catering place that occupies the building now. 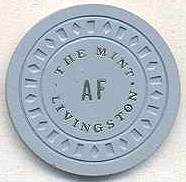 The club was located in a three-story warehouse building at the corner of Ontario Street and Fairbanks, two blocks east of Michigan Avenue, a stone’s throw from Chicago’s famous “Miracle Mile”, created in 1917 as an automat, where home-cooked meals in glass cases could be purchased by inserting coins into slots. During the Prohibition years, a speak-easy known as the Chez Pierre operated upstairs. 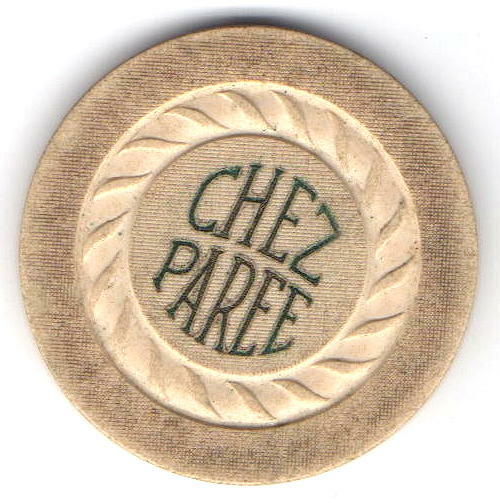 From the repeal of Prohibition through the advent of network television, the Chez Paree nightclub in Chicago was one of the most popular live entertainment venues in the country. For nearly three full decades, the “Chez” played host to the greatest legends of stage, screen and radio -- Frank Sinatra, Louis Armstrong, Nat “King” Cole, Sophie Tucker, Ethel Merman, Milton Berle, Jimmy Durante, Pearl Bailey, and the list goes on. During the radio years, its shows were frequently broadcast around the nation. Maike (Mike) Fritzel and Joe Jacobson opened the nightspot in 1932. In 1949 they sold the business to a group that included Jay Schatz. The property, now called the Schatz Building, is still in the family. In homage to its glamorous nightclub past, the building now houses “The Chez,” a contemporary private event space that offers an elegant backdrop for wedding ceremonies and receptions, private parties, nonprofit happenings, bar and bat mitzvah celebrations, corporate gatherings, etc.